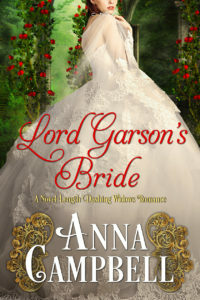 Lord Garson's Bride by Anna Campbell is a solid 4 stars for me! It is the last book in her Dashing Widows series. I've looked forward to Garson's story ever since he was summarily rejected by his fiancé, Morwenna Nash, following the unbidden return of her dead husband. She got her happily ever after but I couldn't help but wonder what happened to the poor guy who had to witness their reunion at the announcement of his engagement. Turns out he was still holding the torch for her even after three years but he's a pragmatic man and as a baron is in need of an heir. Nothing more, nothing less. So he travels north to ask for the hand of Lady Jane Norris. Their fathers were best friends and they knew each other as children. He'd seen her again at her father's funeral. Hugh Rutherford, Lord Garson, sees that Lady Jane Norris is by all accounts as plain and pragmatic as her name. She has been in charge of her father's estate ever since he fell ill just before her coming out. To that end, Jane has spent the last ten years of her life caring for her ailing father and his estate. Now that he is gone, she is at loose ends. The estate will go to a cousin, leaving Jane to either go to her sister's in London or, with little funds, to settle in a cottage with a former governess. Neither prospect truly appeals to Jane for in London she'd be nursemaid to her waspy sister's brood and a cottage by the sea will simply serve to remind her that life once again is passing her by. been, she knows of his rejection and can see how that hurt shadows his face. But Hugh is clear that marriage to him would be mutually beneficial to both of them. Jane would get security without having to have to manage everything all by herself. He already knows she can run a household and offers her a chance to see London, meet new people, and have anything she desires. He offers her mutual respect, companionship, and children. Anything but his love. He thinks one can only have one true love in one's lifetime. Jane, who has always had to make due with whatever life throws at her is practical. She thinks they will rub well enough together. To have a home of her own and children was something she never thought she'd ever have. Having someone to love and be loved in return was not something that she thought was ever going to be a part of her life and so she says yes. welcomed by the ton and Hugh's friends. She meets all the Dashing Widows and their spouses. I have to say, it was great fun to see them all again! everything he could ever need in his life, a beauty both inside and out. This plot sounds great. Isn't is fun to see a couple think that they can keep love out of their relationship only to end up falling in love? Nice! One of my favorite tropes! Oh, I definitely want to read this one - thanks. Me too, catslady. It's waiting on my Kindle. I've put this on my every growing "wish list". I absolutely love Anna's books. Me too, Diane. She never lets me down. I have no doubt I will too! I always enjoy the poor people who truly believe the can "rub along" and all will be well. This sounds like a lovely story. Thanks for the review. Sounds like a wonderful story. I love this type of trope and will look forward to reading this book at some point. Holding on to the part can mar your present and your future. I lived this story. Hugh is a man that a woman would live. He has compassion, is very perceptive and treats a woman like she would like to be treated. Anna Campbell's books are always well worth reading. Unfortunately, I haven't had a chance to start this series. I need to get them all and binge read the set. LORD GARSON'S BRIDE sounds like a nice finish to any set of books as well as one worth reading on its own. Oops! My comment got lost! I was on the road yesterday, just popping in now. Anna Campbell never disappoints. Loved this book! Can't wait for what comes next!